Allium flowers attract a bee. Photo by Barb Gorges. The idea of wildscaping, landscaping your yard for the benefit of wildlife, has been around for a long time. But there is a new spin on it. 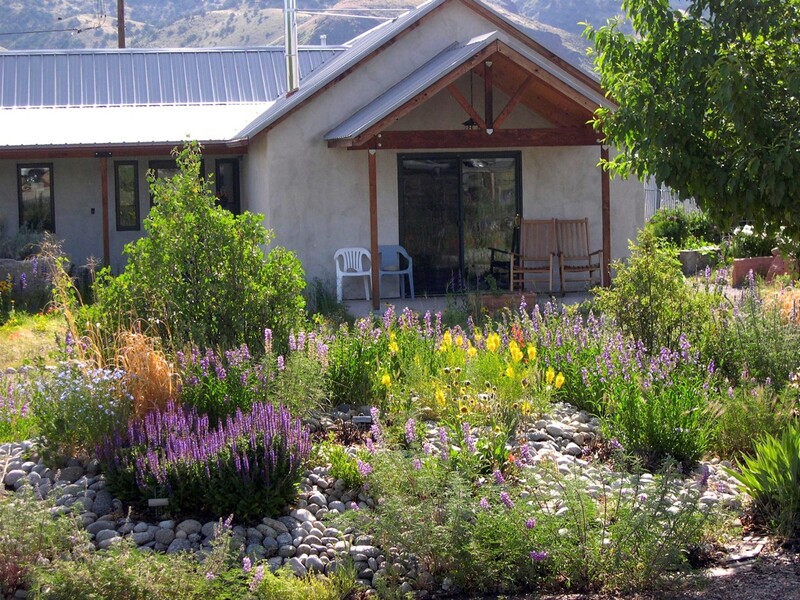 Here, the emphasis is on using native plants to provide shelter and food for wildlife. Our native herbivorous insects usually find the alien leaves to be inedible. And that is exactly why aliens are so popular with gardeners. But, Tallamy writes, if you fill your yard with insect-edible native plants, there will be plenty of insects for birds to feed their young and your yard would be contributing to the health of the greater landscape—and indirectly, human health. Don’t worry, in a healthy habitat, your plants won’t be leafless. So a stand of native trees and shrubs supporting native insects could produce more birds than say, a stand of Russian olive trees, an invasive exotic in Wyoming that has crowded out native species in many places. In fact, land managers are now working to eradicate it. 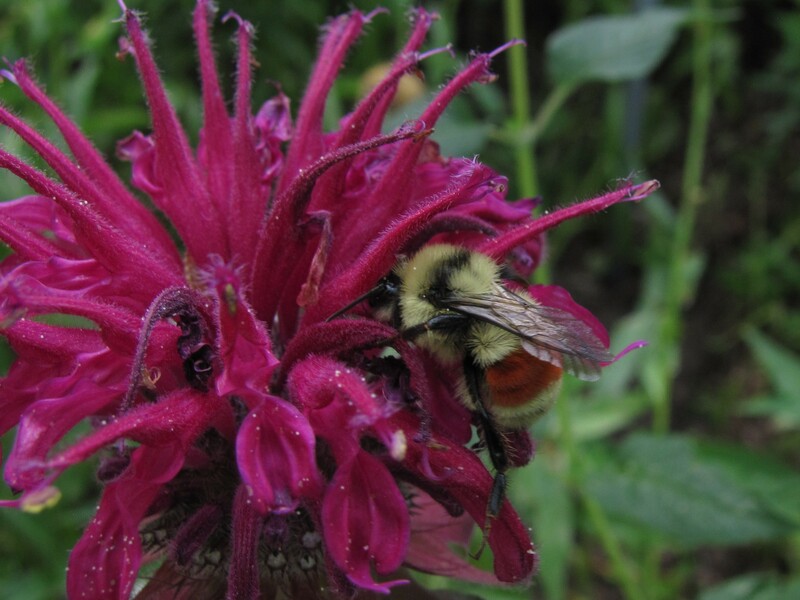 Beebalm (Monarda). Hummingbirds are also attracted to these tubular-shaped flowers in the mint family. Photo by Barb Gorges. 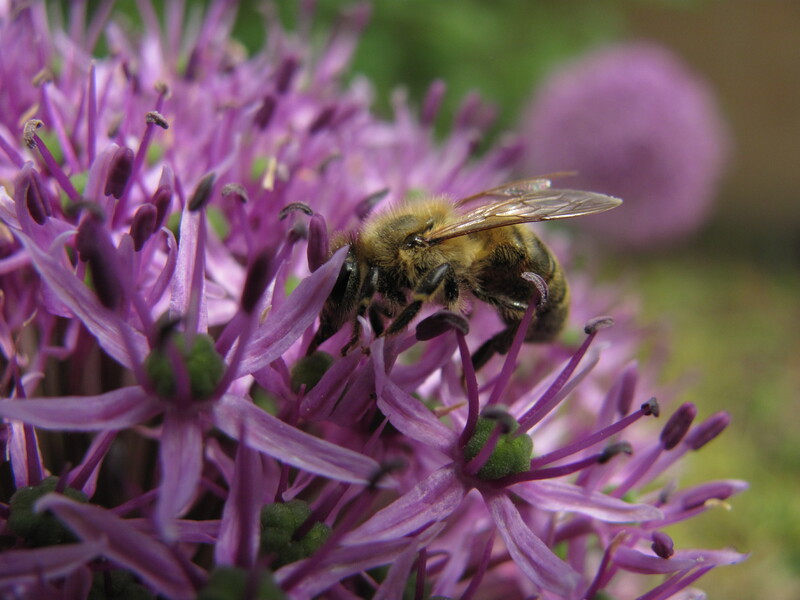 Gardeners can also choose native plants that will provide nectar and pollen for butterflies and bees. That’s important, as both are suffering declining populations. Our natives are better adapted to our location, plant biologist and author Susan Tweit told the 100 people who took part at the Habitat Hero workshop in Cheyenne in March, organized by Laramie County Master Gardeners and the Cheyenne-High Plains Audubon Society. Native plants are also more resistant to our weather extremes. And in our area, they often require less water than aliens, and little or no fertilizer, she added. Tweit also discussed landscape design, another of her specialties. Landscape design is about pleasing combinations of color, form and texture at each season. Wildscaping considers appearance along with providing habitat functions. The mingling of layers, from trees to shrubs to ground cover, besides aesthetic appeal, provides shelter, or cover, and foraging areas for a variety of species that may each prefer different heights and micro-habitats. Tweit cautioned that “going native” does not mean a weedy-looking patch. You can still choose formal, cottage style, meadow, or minimalist. Simply fill the space with natives. People moving into a newly-built house usually get to work with a blank canvas. But where do you put native plants in an established yard? The trick is to keep your high maintenance, water-loving conventional aliens, if you still want them, in one area of your yard. Don’t mix these with native plants, as too much water can be deadly. 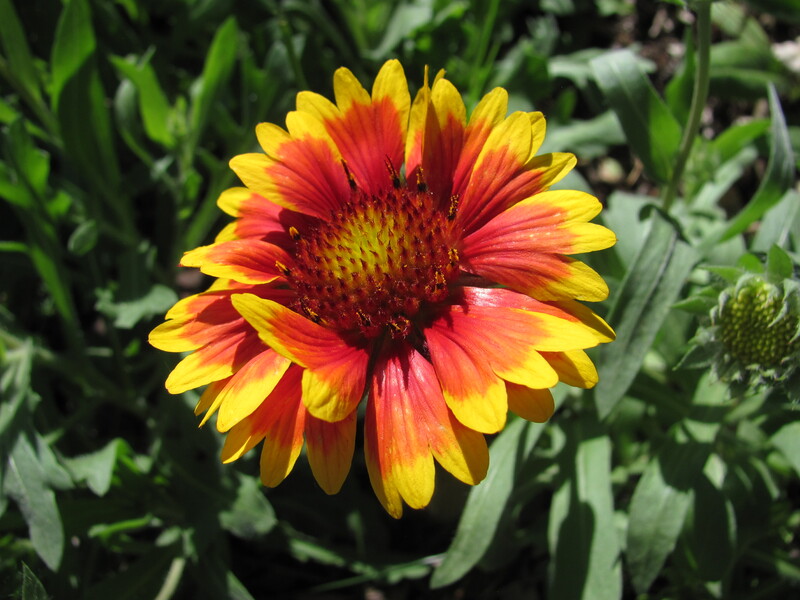 Blanketflower (Gaillardia). Photo by Barb Gorges. You can gradually replace your alien trees and shrubs with natives. Replace alien annuals (like petunias) with native perennials. Widen your flower borders. And one year at a time, replace sections of your Kentucky bluegrass turf, which is another alien species. Tweit said her method for converting lawn is to smother it with layers of newspaper held down with rocks. She doesn’t recommend killing turf with black plastic. That method collects heat and cooks the grass, but it also kills important soil organisms. As a last resort, use Roundup, the least offensive herbicide. Follow directions. At our house, when expanding flower beds, we cut clumps of turf with a sharp spade and either turn each piece upside down in place, or shake off the dirt and take the roots elsewhere to compost. Think about naturalizing remaining lawn with small, spring-flowering bulbs, like species tulips. They provide pollen for bees when little else is blooming so early in the season. By the time the grass needs mowing, their vegetation will have died back. Water is part of the complete wildlife habitat. If you don’t have a pond or flowing water on your property, you can use a recirculating water pump in imaginative ways. Or a valuable low-tech solution Susan mentioned is water in an upside down garbage can lid embedded in the ground, with rock perches around and in it. You can include a product called a mosquito dunk, which releases a bacteria in the water that is toxic only to mosquito larvae. You may also try a patch of wet sand to attract butterflies. 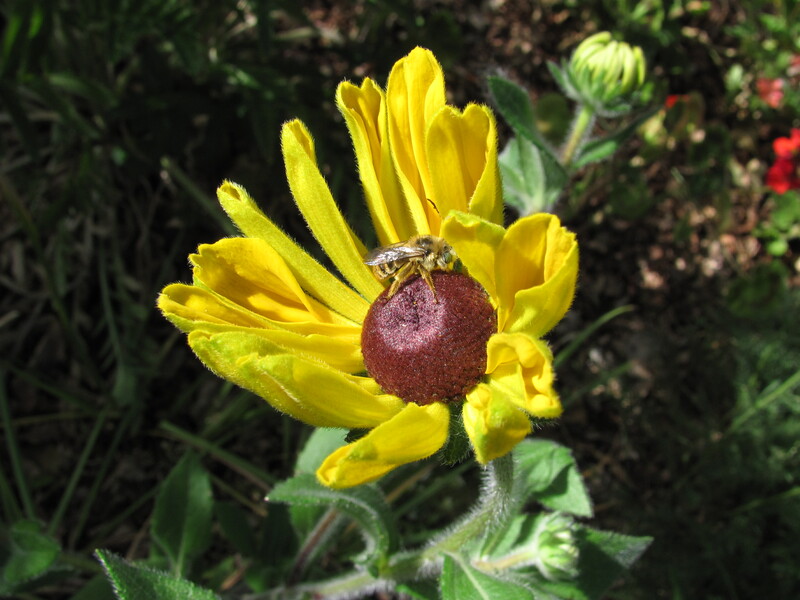 This Black-eyed Susan (Rudbeckia) attracted a bee before its petals fully opened. Photo by Barb Gorges. Without being a field botanist, how will you know which plants are native to our area? One resource is the book “Growing Native Plants of the Rocky Mountain Area,” co-authored by Jane and Robert Dorn of Lingle. Jane was also a presenter at the workshop. It features an illustrated selection of 500 plants, their favorite kinds of habitat and tips on growing them. Hard copies are available through www.lulu.com. Cheaper, digital copies will be available soon through Cheyenne – High Plains Audubon Society, http://home.lonetree.com/audubon/. Meanwhile, the chapter website has the Dorn’s list of 114 native species specifically recommended for our high plains. It is a jointly sponsored publication of the Wyoming Game and Fish Department, Bureau of Land Management, Audubon Rockies and Wyoming Partners in Flight. This publication gets into the nitty-gritty of sustainable gardening practices and also has a plant list. Native plants, by definition, are the plants that evolved in the local area. But local nurseries are only beginning to catch on to the value of natives. It is cheaper to start your new wildscape from seed, of course, and there is a lot more variety available that way. Do not dig up native plants in the wild unless the site is about to be bulldozed, and only with permission. The good news is, savvy nurseries and seed catalogs have more and more natives available. But be sure to read carefully as not every plant offered is suited to Zone 5, our USDA plant growing zone, though Zone 4 seems more appropriate. Horticulturally improved varieties of native plants—selected for brighter colors, bigger flowers or longer bloom times—can be OK, Tallamy says. They are close enough to the original natives to function in the same way. When shopping, avoid plants treated with neonicotinoids, types of systemic pesticides that poison bees when they collect pollen from treated plants. For more information, see the Xerces Society website, http://www.xerces.org. Audubon Rockies wants to recognize everyone who strives to make their yard more wildlife friendly. Check www.HabHero.org to find out how to nominate your yard this summer. Try local nurseries and garden centers and then look for native plants through these regional sources. In close proximity to Susan Tweit’s house, this bed of native plants is arranged more formally, with cobbles providing additional texture and mulch. Courtesy/Susan J. Tweit. Categories: Native perennials, Wildscaping | Tags: Audubon Rockies, Cheyenne, Cheyenne-High Plains Audubon Society, Douglas Tallamy, gardening, Habitat Hero, Jane Dorn, landscaping, Laramie County Master Gardeners, native perennials, native plants, Robert Dorn, Susan J. Tweit, wildlife, wildscaping, Wyoming | Permalink.